Making the right finish choices for your new kitchen can sometimes be intimidating, especially if those choices are attached to large price tags. 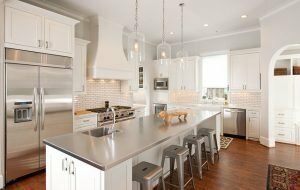 A kitchen remodel is certainly an investment of both your money and your time, but the results will add value to your home. The right choices in flooring, kitchen countertops, and cabinets can completely transform your space. Ready to get started? We recommend beginning by choosing an inspiration piece to launch your color palette and style, such as hand-painted tiles, a reclaimed barn door, or an ultra modern chandelier. Next, tackle each element of your kitchen finishes one at a time and before you know it, you’ll have an incredible space to enjoy with family and friends for years to come. The Countertops: Choose a countertop that’s durable and easy to clean– you’ll thank yourself later. Granite or composite materials like Caesarstone go with just about anything and are virtually indestructible. For more of a statement, look into stainless steel or natural wood. The Cabinets: Simple, natural materials like wood or painted glass is a great choice. Light colors will keep your space open and bright while dark colors can create an elegant, more formal ambiance. The Backsplash: Much like an area rug, the backsplash can add a pop of color and really pull everything together. Choose a backsplash color that visually contrasts with your countertop and cabinetry, or go subtle and sleek with a monochromatic backsplash in a contrasting texture. The Floors: There’s no way around it: kitchen floors take a beating. Wood is a popular choice these days for both durability and cost. Ceramic tile is also a fail-safe bet for just about any style and budget. Looking for something a bit more earthy? Try natural stone. The Details: You’re almost there! The last touches – the lighting, fixtures, bar stools and hardware will tie the look of the kitchen together. Bonus: you can swap out these design elements later on to change up the look of your kitchen without a major overhaul. At ACo, we strive to make every renovation, especially your kitchen renovation, smooth and convenient. Our knowledgeable design and production team will work with you every step of the way to ensure a worry-free renovation. To begin designing your new kitchen, visit our website at www.liveaco.com or give us a call at 317-575-9540.